The following upholstery staple gun guide and review is from Shelly Leer of ModHomeEc. She’s runs an upholstery studio in Indianapolis and also offers classes for the DIYer who always wanted to recover their furniture. Shelly has a ton of great tutorials on her website and she just recently started offering an online upholstery class called Upholstery Knockouts. If anyone is qualified to offer advice on staple guns it’s her! You just cannot find a good stapler at the hardware store!!! As far as my research and purchases have proven, they don’t sell upholstery worthy staplers at Lowes or Home Depot. The gun on the far left, made by Maestri, is electric and it’s the one I use in my beginning classes. As far as electric staple guns, it’ s not as powerful as a DuoFast, but it has a safety on the handle and it’s lighter weight. It does have some kick back which, when used on a hardwood, makes it difficult to get the staple fully driven into the wood unless you put extra pressure on the nose end of the gun while shooting staples. It also tends to jam, but that’s an easy fix. Orangey, in the center, is my favorite. It was the stapler I used for all of my twenty years of upholstering. It’s made by Rainco. It’s pneumatic and has all metal parts. Nowadays, they’re not all metal, but they are lighter weight. The gun on the far right is probably the best buy for the beginner. It only cost me about $25.00 a few years ago at Harbor Freight, it uses larger staples than an upholsterer’s staple gun, and like Orangey, and it’s powered by an air compressor. The down side of those thick staples is that it can grab a thread when you’re securing medium to lighter weight fabric and cause a pull. 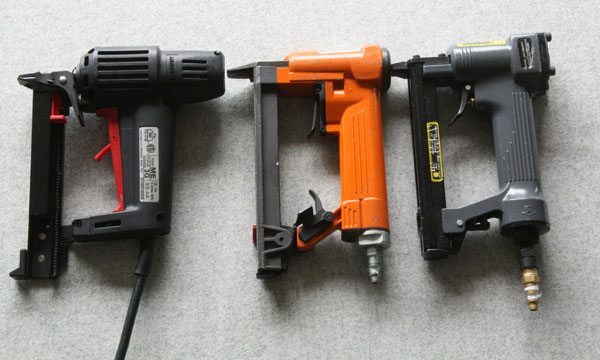 However, Once you try a pneumatic stapler, you’ll never go back. Then, there’s the electric stapler workhorse made by Duo Fast. It comes highly recommended (by me), but it’s a little bulky for tight spots. Priced above $200.00, my students almost fight over who gets the Duo Fast staplers. A few years ago, they were thrilled to just have an electric staple gun, let alone being concerned about the power it packed. If you’re in the market for a good staple gun, go to Nailgun Depot. That’s where I get my staple guns these days. You need to wade through all of their other staplers, and get to the upholstery staple guns. If you’re planning on upholstering for awhile, I’d invest in the BeA Long Nose gun. It’s on my Christmas list. For more information about Shelly, check out our interview with her on Built by Kids.